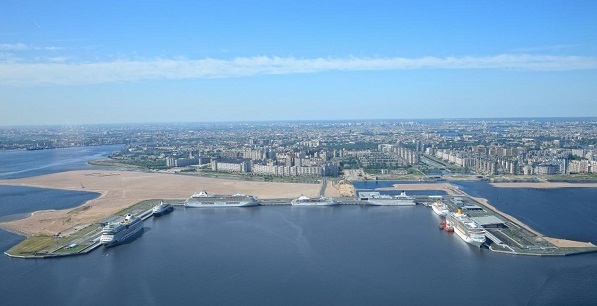 St. Petersburg is one of the centers of international tourism and the new Maritime station plays an important role in the development of the cruise and ferry industry in Russia. 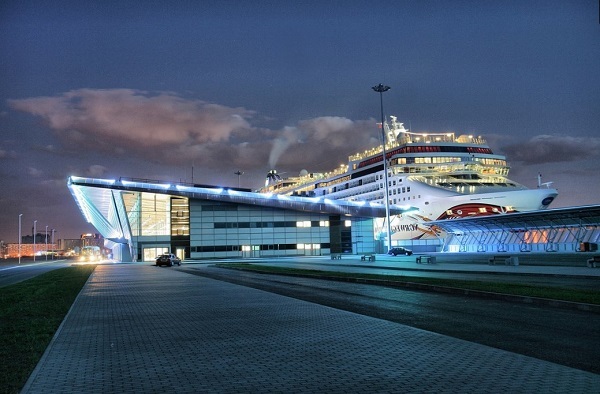 The Maritime station is part of the only specialized passenger’s port in Russia built by the Marine Facade Company in less than five years. The Maritime station in St. Petersburg was opened in 1982 on the western edge of Vasilievsky Island. Built on the shores of the Finnish Gulf due to the project of the architect Vitaly Sokhin, the seven-storied building is notable for its expressiveness.It is decorated with panels in the form of sails and a 78-meter spire with a ship at the end, for its work the architect was awarded by the State Prize for the original stylistic decision. At the same time, ships of more than 200 meters in length could not be moored at the old port and they had to come to the Commercial Port of the Northern Capital (freight). In 2002, it was decided to create a new complex for the reception of modern liners. In 2008, the owners of the Maritime station together with a group of officials admitted that the old building was tight; it didn’t consort with modern standards of technical exploitation and it has been decided to build a new complex in its place. The old building, built according to the most modern technologies of the Soviet era, was the third tallest after the Peter and Paul Fortress and St. Isaac's Cathedral.From a distance it reminded a sailboat, the openwork and unusual appearance of which proved that in the Soviet Union architects are able to create and construct interesting projects.In those years, leningraders came to the Finnish Gulf to walk along the embankment, admire the unprecedented architecture and see the luxurious for that time interiors. The building was decided to be demolished only because the passengers spent about two hours on the passing of all customs procedures, and in the new complex this time was reduced to 20 minutes.The question of its re-profiling at that time was not even considered - it was much easier to demolish it, because the building was not included in the list of historical buildings, as it was less than 50 years old. In 2008, only an accident saved the construction.On the place of the old Maritime station it was planned to build two business centers with towers of 60 meters high.The town planning council decided that the towers were too high, the project should be changed by reducing the towers on eight meters so that they did not stick out like horns visible from all parts of the city. The coming crisis of 2008 led to the freezing of building process and the decision to demolish the old Maritime Station was postponed.Thus the pearl of Leningrad architecture on the Vasilievsky Island was preserved. For a long time, the building was not used for its intended purpose and there were shops and offices in it. In recent years, when the cruise company St. Peter Line has organized regular flights to Stockholm and Helsinki, check-in counters and waiting room, customs and border guard service, ticket office and bank branch, hotel and other services were located there. The new station - Maritime Facade - is a complex which consists of four parts - maritime stations, each of which includes berths, terminals and parking space.Its solemn transfer to his city took place on City’s Day on May 27, 2011. In total there are seven berths on the territory of the port, from 270 to 375 meters in length, the depth of the bottom at the berths is 10.7 meters.The total length of the quay wall is more than two kilometers.The ships of up to 317 meters in length and up to 8.8 meters in draft can be moored at berths. Near the berths there are parking places for buses and cars. Terminal № 1 is located at berths № 6 and 7, which accept cruise ships. In its building there are 36 border control booths and a duty-free shop, near the platform with canopies for 66 tourist buses, as well as parking space for buses and cars are located. 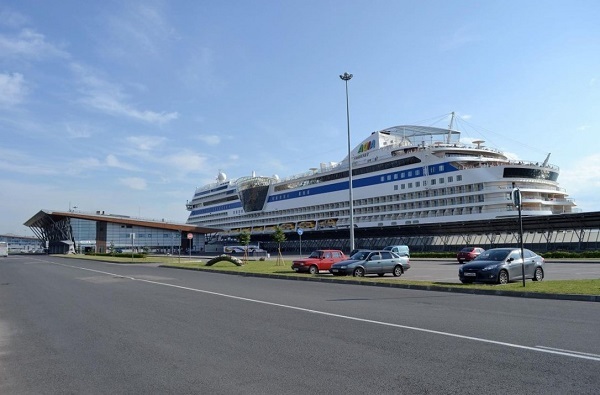 Terminal № 2 is located at berths № 4 and 5, intended for servicing of cruise liners. Inside the building there are 28 border control cabins and a duty-free shop. The platform under the canopy is calculated for 38 buses, there is parking space for buses, cars and minibuses. Terminal № 3 is located at berth №3, which can take ferries up to 245 meters in length and cruise ships.The building has 20 border control cabins, a platform under a canopy for 23 buses, as well as parking space for minibuses and cars. Terminal №4 is located at the berths № 1 and 2 serving cruise ships.The terminal building has a duty-free shop and 32 border control cabins.Under the canopy 45 tourist buses can accommodate. All terminals have comfortable conditions for the staying of passengers, including for people with disabilities. 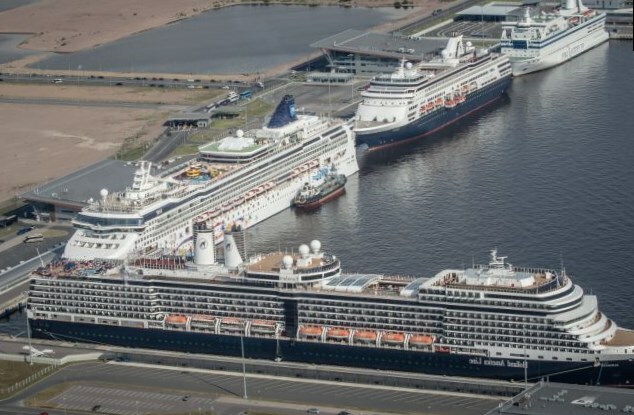 The new Maritime station was recognized as the best transit port in the 2009 at the Seatrade Europe exhibition in Hamburg, and by the end of 2010 it was awarded by the Dream World Cruise Destination in the nomination "The Most Modern Port Facilities".